View from the highest point on the Parkway at 6,053 ft. The Blue Ridge Parkway celebrates its 75th anniversary this year, so if you’re in need of a summer road trip, this might just be the one to take. Check out my top picks for must-see attractions along the way in the latest issue of AAA World. 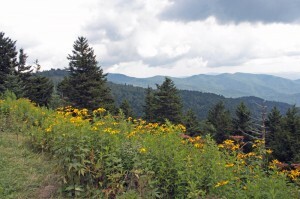 And if you really want the lowdown on what to see on and off the Parkway, be sure to order a copy of my new book, Moon Blue Ridge and Smoky Mountains (Avalon Travel, 2010), which hits bookstores around the country within the next couple of weeks. You can also order a signed copy from my web site.